One of my favourite events of the year is the Cambridge Open Studios in July, where local artists of every genre open up their studios for the public to visit and see their work. Open Studios members also host other events throughout the year and the website contains details of several local artists – so you can contact them directly all year round. Selection of contemporary bangles, by Birgitte Bruun. Birgitte Bruun is a Danish born jeweller who makes some beautiful pieces using a range of stones, metals and techniques. Her jewellery has a really contemporary feel and I particularly like her bangles, including the beautiful opal cuff in the picture below – the perfect gift for someone with an October birthday (though I’m probably better suited to an Aquamarine gemstone myself…) . I visited her studio a couple of months ago when buying a birthday present for a friend and all her pieces were so lovely it took a long time to decide what to buy. If you’d like to see some of Birgitte’s jewellery you can arrange a visit to her studio via her website, or you can catch her on 2nd December at Mill Road Winter Fair – where she will be hosting a pop-up stall at the Makers Gallery in Hope Street Yard. Opal cuff, by Birgitte Bruun. Agnes Asselin uses textiles to create pictures as well as jewellery and other accessories. These are colourful pieces and mostly African inspired, with designs including people and a range of animals. Last year I visited her studio and bought the giraffe in the photo below – I think he’s going to need a friend at some point so will no doubt be paying another visit to the studio soon. Agnes will be opening her studio (just a three-minute walk from Mill Road) on 2nd December for Mill Road Winter Fair. Sarah Went makes beautiful ceramics. I’m yet to visit her studio myself, but her designs look like they are just what I want in my kitchen. I bought a handmade ceramic butter dish – which I adore – at an independent craft fair a couple of years ago, but having seen pictures of Sarah’s I have now decided that you can never have too many butter dishes… If you too would like to see some of Sarah’s ceramics, she will be opening her studio as part of Mill Road Winter Fair. Saturday saw the opening of the 2013 Cambridge Open Studios – an annual exhibition where local artists open up their studios and homes to the public across four weekends in July. It’s a great opportunity to find out more about the artists and see where they work, as well as enjoy what is probably the largest art exhibition in Cambridge (albeit at a range of venues) – there are over 269 artists taking part this year! The roots of Cambridge Open Studios go back to the 1960’s and this year’s exhibitors include sculptors, potters, ceramicists, silversmiths, furniture makers and printers – as well as those working with more traditional media – so there should be something for everyone. I usually take the opportunity to go and see work locally when the exhibition is on and this year there are over twenty exhibitors on and around Mill Road alone – including animal sculptor JJ Vincent, jewellery designer Lindsay Duff and painters Sheila Farrant and Tim O’Brien. This year I’ll also be taking a trip out to some of the ones further afield – if you haven’t seen Georgia Record‘s artwork yet then I highly recommend a viewing. Her work is mainly oil painting on canvas, stick-and-ink drawings and photography and she’s one of the most exciting young artists whose work I’ve seen! You can search for exhibitors by name, location, media type or even on a map. You don’t need to book and it’s free, so if you want to get to know your neighbours better why not drop in to some of the exhibitions near you! I hope everyone enjoyed Mill Road Winter Fair on Saturday. There was so much going on that I didn’t even get to see half the things I had hoped to, but I still thoroughly enjoyed myself. What better way to start the day than with some foodie delights, so I decided to make some dark chocolate and dragon ginger truffles first thing in the morning. Although I am not vegan myself, I have tested various truffle recipes over the last few months and the one that tastes most delicious just happens to be vegan. They seemed to go down a treat with everyone that tried them and I had a few people ask me to make some for them to give as presents – so I will probably be spending quite a bit of time in the kitchen over the next couple of weeks! I did a tour of the very busy Food Fair at Gwydir Street car park, which had some amazing edibles. The crowds were so great that you could only move in one direction, so if you passed a stall without stopping it wasn’t easy to go back. The Afternoon Tease stall had already sold out of all three (!) chocolate and Guinness cakes by the time I arrived, but I did treat myself to one of their lovely rum cup cakes. I saw some delicious looking burgers at one of the farmshop stalls and decided that I had to have one, but then I realised that there was a very long queue indeed, so I’m afraid I gave up. I tasted lots of food at the Fair including a lovely free jacket potato with cheese and coleslaw, courtesy of ‘Joseph’ outside Mill Road Baptist church. But I have to say my favourite food of all was the chickpea curry at Lally’s News, it was really warming and spicy, and possibly the best vegetarian curry I have ever tasted – Amrik and Raj are known locally for their delicious curries, and deservedly so. There was lots of music along Mill Road and I saw people jiving on the Broadway. At one point I could hear my friends band playing on Mill Road bridge. I heard later from others that so many people were dancing to the music on the bridge during the day that the bridge, rather worryingly, actually started to shake (eek!). There was some great music at Argyle Street Housing Co-op in the afternoon, including musicians from the Jam Band Caravan collective playing folk and reggae, and I even heard some thrash metal at one point (!). Myself and Mr Mill Road decided to pop in to the Earl of Beaconsfield in the afternoon in the hope of having a nice warm cup of coffee, but when we arrived the place was packed and everyone seemed to be drinking mulled wine – which sounded like a marvellous idea, and so we ordered some without hesitating. I don’t normally drink red wine, but mulled wine is different and this one tasted so nice that I decided to go and buy the ingredients (cloves, dried ginger, a cinnamon stick and a bottle of Chilean red) on Mill Road so I could try making some at home. The resulting mulled wine was great and I shall definitely be trying this again over the next few weeks (probably quite a few times!). For me though, the best part of the Fair was bumping into so many friends as well as chatting to lots of people I’d never met before; and the absolute highlight for me was getting to meet my friends’ daughter for the first time – who at just two and a half weeks old was possibly the Fair’s youngest visitor! A massive well done to everyone involved in making Mill Road Winter Fair happen, including the Committee and all the visitors that came along on the day – it’s great to live in such a diverse and inclusive area that has so many community-minded people. I usually take my camera everywhere I go (much to the dismay of some of my friends – who I’ve managed to take some rather ‘surprised’ pics of over the years) but a few weeks ago I realised moments after leaving the house that I didn’t have it on me. Even though logic told me that nothing too exciting was likely to happen on my three minute round trip to buy a pint of milk at the local shop, for some reason I felt compelled to go back and get it – just in case. 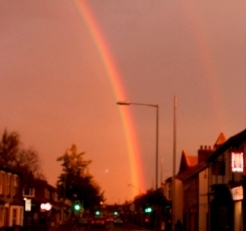 I was very thankful I did go back, as just moments later a beautiful rainbow appeared over Mill Road! Lots of people stopped in the street to take pictures and people came out of the Earl of Beaconsfield, Billy’s and the sushi bar to see exactly what it was that I and others were pointing to in the sky. 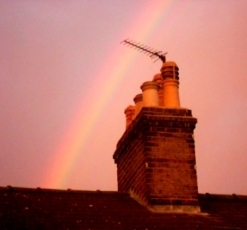 From where I was stood it looked like the rainbow was emanating from the roof of Limoncello and looked so beautiful. 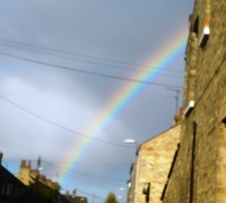 As I looked behind the Beaconsfield I saw another rainbow appearing over the rooftops and then a few moments later a third one appeared to the south of Mill Road. 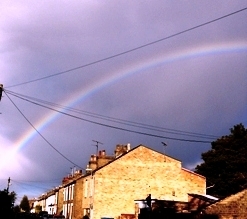 I had never seen more than one rainbow at a time before, it looked amazing. By this point it was raining heavily, but in my quest to get a decent photo I decided to stick it out for a few more minutes.